The ever increasing popularity of the magfed movement has caught the eye of Tippmann. Since this style of play, which requires more skill, stealth, and strategy is so popular amongst the mil-sim community, Tippmann decided to make their first magfed rifle. Tippmann has created the TCR (Tactical Compact Rifle), a highly versatile magfed marker. The TCR comes equipped to be played in magfed games, or traditional hopper games. This can be powered with either a 12gram Co2 cartridges, or an air tank can be used with a remote line. Customization is also a category the TCR excels in, with four picatinny rails the TCR can handle all of your tactical upgrades such as sights, grips, flashlights, and lasers. Tactical Compact Rifle, designed and made specifically for magfed play! The TCR's number one selling point is it's great versatility. While this gun was designed to be used in mag fed play, it is not exclusively for magfed play. It can easily be switched into a traditional hopper fed gun. Also since this marker is a "compact rifle" it is suitable for both long range firefights, as well as close quarter combat. 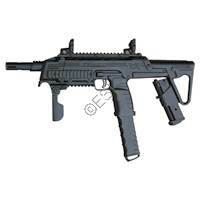 The TCR is built on the already trustworthy platform of the Tippmann TiPX paintball pistol. Tippmann going with the tried and true TiPX platform should eliminate all "first edition errors" that can sometimes occur when a new product is introduced into the market. Another benefit of Tippmann using the TiPX platform is anyone with knowledge on how to fix a TiPX, is also going to know to fix those problems on the TCR. Perhaps the most groundbreaking feature of the TCR is how the marker gets its air. The TCR is capable of using 12 gram Co2 cartridges, that can be configured to release from either the right or left hand side of the marker. The design makes 12 grams a legit option for powering the TCR, and can be changed with one hand during intense combat. This marker can also use a traditional sized air tank with a remote line, as it has a flip down remote adapater already installed. The TCR comes with two different magazines, one 7 ball tru-feed magazine and one 12 ball tru-feed magazine. The TCR is also compatible with the popular 20 round Zetamag from Stark Pursuit. Customization is normally a big selling point for Tippmann products, and the TCR is no different. It was built on a modular design for future upgrades, meaning we will be seeing body kits much like the Phenom. Also the TCR comes stock with four picatinny rails, meaning you can put sights, scopes, flashlights, lasers, grips, and almost any other tactical upgrade on your TCR.